Ald. Eleanor Revelle (7th) speaks at a City Council meeting. Revelle said on Monday she opposed a possible roadway through Isabella Woods, an undisturbed oak forest in northwest Evanston. Members of City Council voted Monday to reject a possible roadway through Isabella Woods, an undisturbed oak forest in northwest Evanston. Isabella Woods is located north of Isabella Road and is currently leased to the city by the Metropolitan Water Reclamation District of Greater Chicago. The Cook County Department of Transportation and Highways asked the MWRD in April to build a road through the woods for a housing developer. The property is owned by the Keefe family trust, which seeks to develop residential homes on the vacant land, according to city documents. The Department of Transportation and Highways requested a 75-year lease on the property April 28 to build the road. “The easement is for the construction, operations, maintenance, rehabilitation, and removal of an access road to reach private property in Wilmette,” the request reads. Ald. Eleanor Revelle (7th) said at the meeting that the Keefe family began requesting easements in the 1980s to build a number of homes that would require an access road. She said the family requested to build the road several times but was ultimately turned down. According to a provision in the original 1965 lease between Evanston and the MWRD, Evanston must give up its possession of any part of the land required for the construction of highways or access roads. The portion of Isabella Woods that would be affected by the easement contains 55 trees in an undisturbed forest, which provides a habitat for birds and other wildlife. A tree survey by city staff determined that for the road to be constructed, 33 trees will have to be removed, and an additional 15 adjacent trees may die. City documents state that if the easement is granted, the trees must be replaced or paid for under the Tree Preservation Ordinance. 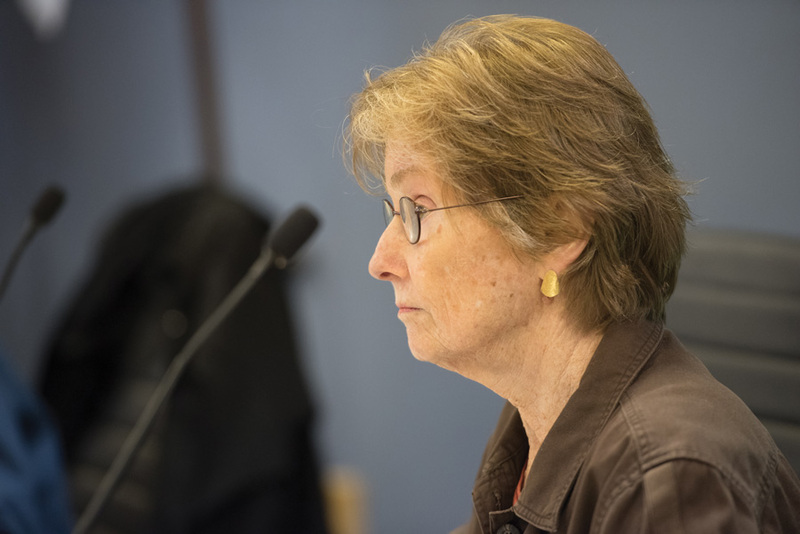 Wendy Pollock, co-chair of the Evanston Environment Board, stressed the importance of Isabella Woods as “green infrastructure.” She warned that planting a grove of young trees would not make up for the oak trees that have been growing there for hundreds of years. Carl Bova, an Evanston resident and civil engineer, said he agreed with Pollock’s assessment. If the access road is constructed, he said it would affect the wet parcel of Isabella Woods and take away its stormwater diversion properties. “It is very possible that the City of Evanston would have to upgrade its storm sewer system to account for the lost storage and to preserve a roadway,” Bova said. The MWRD Board is set to consider whether to grant the easement in a May 18 meeting.